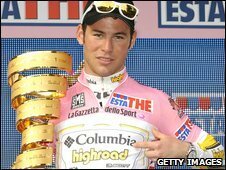 Mark Cavendish became the first British rider to wear the Giro d'Italia leader's pink jersey after his Columbia team won the opening team time trial. The team finished the 20.5-kilometre route along Venice's beach front in a time of 21 minutes 50 seconds. The Garmin-Slipstream team, including Britons Bradley Wiggins and David Millar, were second, while Lance Armstrong's Astana finished third. "To win we all have to be at 100% so it's a team victory," said Cavendish. "It just happens that I wear the jersey for the team. Someone had to cross the line first. "If I win the sprint on Sunday, as I hope, it will be different." Cavendish, who won two stages at this event last year and four in the Tour de France, was the only British track cyclist not to claim a medal at the Beijing Olympics and this week criticised what he sees as Britain's obsession with Olympic success. In Venice, the 23-year-old's team went out first and he had an anxious wait before the victory was confirmed. Cavendish has already recorded eight victories this year, including the prestigious Milan-San Remo, and was overall best sprinter in the Tour of California. American seven-time Tour de France winner Armstrong is contesting his first major tour for almost four years after making his comeback at the start of this year. The 37-year-old recently played down his chances of winning the Giro d'Italia after suffering a broken collarbone last month following a crash but said that he expected to claim at least one stage during the event. "I felt all right for an old man," he said. "Yeah, I think we're pleased with that, considering the amount of preparation we put into it, which was minimal but as much as we could." Armstrong crossed the line first for Astana and is 15th in the overall standings. Danilo Di Luca, the 2007 champion, led Team LPR to fourth place on Saturday, 22 seconds back. Ivan Basso's Liquigas had been expected to give everyone a run for their money but came in 40 seconds behind Columbia while compatriot Damiano Cunego's Lampre team were two seconds further back. "Our squad has been picked with three weeks in mind. We are only at the first day," said Basso. Sunday's 156-km second stage goes from Jesolo to Trieste in the very east of Italy. The finish is in Rome on 31 May.